Hello and Happy Friday! It’s mid-August already, and it’s once again time for a ScrapMuch? Team A Sketch-y Friday reveal! The patterned paper and flair are from Lawn Fawn. The mist is Heidi Swapp Color Shine. The cardstock is Bazzill Basics. The sequins are Teresa Collins. The washi tape is from Bella Blvd. The little button is American Crafts. The fun puffy tag sticker is from Evalicious. And the ink is of course Tim Holtz Distress. I found myself reminiscing about my favourite place on earth and thought it was a good idea to scrapbook some happy memories from there. 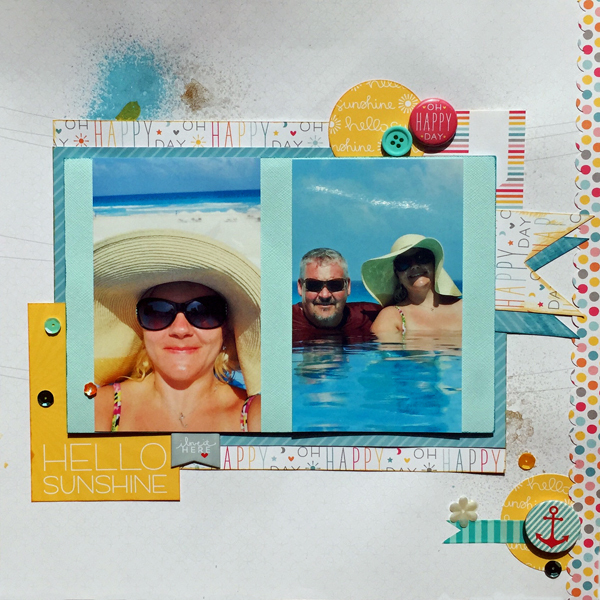 I thought this paper from Lawn Fawn was perfect to help me capture some super happy fun in the sun memories! And once again it’s your turn! Hop on over to the ScrapMuch? blog to see what the rest of Team A’s inspiring creations. Then make your own layout and share it with us for a chance to win an awesome ScrapMuch? prize! Here is a run down of our Sketch-y Friday rules. Just link up your creations in our sidebar to be entered into a random draw for our monthly prize. You have until August 29th, at midnight to participate in any of this month’s sketch challenges, each linkup tool will remain open until that date! You may take some artistic license with your adaptation of the sketches, however if you choose to use a double page sketch for a single page layout you may only enter once per sketch, not once per side.